The Colors Of Indian Cooking: Evvvvverybody Loves Mango!! Whenever I'm planning any sort of Indian feast at our house I always try to keep things balanced. Hot, sweet, sour, bitter, crunchy, mild. I try to get all the flavor experiences in there. Since all the courses at an Indian meal are served all at once (except dessert) it helps to have a wide range of stuff on the table. One dish that always does double duty on my table is something cool and sweet with a hint of tart and a bite of chili, and that is Mango. And yes...who doesn't love mango? Sliced diced, in ice cream, on salads, mango seems to get along with everything. It's the non-diva fruit. One of my favorite uses of mango is as a side dish salad, mango curd. Mango curd works especially well with spicy South Indian food, but wait…it also goes beautifully with good old barbequed chicken. Actually it tastes so good you might want to just eat a bowl of it all by it’s lonesome. If you’ve got a blender or food processor it’s also very easy to put together. Once it’s pureed and mixed with yogurt, then hit with a spicy chaunk, it’s ready before you know it. Peel and chop 1 of the mangos and place it in a food processor or blender along with the coconut, green chilies and cumin seeds. Add a bit of water and blend everything into a fine paste. Put 2 cups of yogurt into a bowl and whisk it smooth. Add the contents of the blender along with salt to taste. Heat the teaspoon of oil in a small pan. When the oil is hot, add in the mustard seeds, cumin seeds, the red chili and the curry leaves. 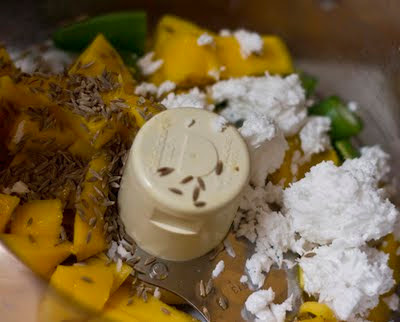 When the mustard seeds start to pop, pour everything into the yogurt mango mixture. Peel and cube the other mango and mix the pieces into the yogurt mango puree. Scatter a few chopped cilantro leaves over everything and serve it up. This is a great side dish great with any Indian meal vegetarian or not, but also does double duty alongside any spicy American-style barbeque. So there you have mango, short, sweet, and easy to make (rimshot goes here). And now that mangos are in season and relatively cheap almost everywhere, what's stopping you? Oh I love mango oh how I love this recipe oh you are going to have to come visit! Looks delish! Mango is fantastic. Oh my gosh. That photo is hilarious - Mango! An awesome character. Gotta love mangoes. Alfonso ones are incomparable. This looks and sounds delicious...the traditional one here does not use tempering and cilantro. @? I'd love to hear about it. Could you send me the recipe? I agree everyone loves mango. I also like your mango salad post; fruit in salad is so refreshing and mango add a level of sweetness to a dish that is hard to find in other fruit. There's 1 teaspoon of cumin seeds in the ingredient list. Cumin is in the blender ingredients and also in the pan ingredients? Do we use 1/2 teaspoon in each? Thanks. 1/2 of the cumin seeds in the blender, the rest in the chaunk, yes, you are correct..sorry for the error!